The rest of my daughter’s sentence sounded like an adult in a Charlie Brown special. Anna spoke clearly enough, but I focused on the impending reality of those last four words. 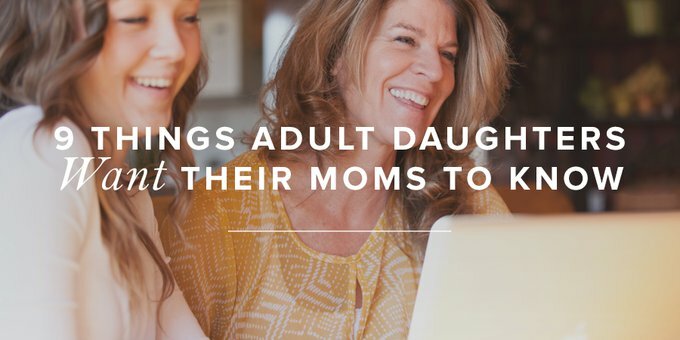 When my daughter, Anna, was a senior in college, I asked her to make me a list of things a mother needs to know about her adult daughter. She and her friends crowded around a lunch table, and with notebook pad in hand, Anna scribbled down their replies. Here is what they had to say. Daughters take in more than you may realize. You were our first teachers. We watch how you treat your friends and strangers, but most importantly, our fathers. We learn from you what a godly wife looks like and how men should treat women. Yes, we learn from you—not just our dads—how men should treat women. Mothers who tolerate destructive relationships often produce daughters who enter abusive relationships. Put away your smartphone, your to-do list, and your keys. Sit down and look at us when we’re speaking. We want to tell you about our problems, but that doesn’t necessarily mean we need you to fix it. We often need love, not advice. Listening is love. Haven’t you explained the same thing to your husband? Ditto with us. Oh, and yes, sometimes we don’t listen well either, so how about we both try to be better listeners and agree to help each other on that one, okay? We get so frustrated when you hover, critique, and worry about every little thing. If each time this happened were a brick, we could build the Great Wall of China. We don’t see it as love. We see a mom who doesn’t trust us to do things well or trust God to lead us. Be it something as simple as cleaning the kitchen or as important as making a career choice, remember you have already raised us. We will do the right thing at least some of the time, so don’t be a control freak mom. Trust the God who is always in control. He’s got us. You said so. It does not matter how old we are, we hunger for your words of encouragement. You don’t tell us often that you think we turned out pretty great. We may brush off your praise when you do, but we’ll remember your words when fear invades our souls. And it does invade us—all the time. If Joshua Harris kissed dating goodbye and still managed to marry a godly woman, why can’t you stop nagging us about the subject? If we are single, don’t worry, we haven’t forgotten. We know you want us to get married, and most of us want to be married, too. But pressuring us to date won’t guarantee a godly marriage, okay? In fact, your well-intentioned nagging can cripple a dating relationship. Oh, and side comments and jokes hurt—a lot. We get enough dating pressure from the world. Please don’t add to it. Ask about our spiritual walk. Please ask us about our Scripture reading, and tell us about what you’re reading, too. We want your expertise and opinion. Accountability works best when we feel safe. You were the first person to shield and protect us. If you talk with us about our spiritual walk now, you’ll be the person we come to with doubts and questions. And we will have them, just like you did. We forget to thank you often. We know moms are incredible human beings and we fail to thank you often. So . . . thanks for the late nights and long hours, for being the taxi driver, the chef, the maid, and the shoulder to cry on. When we become moms one day, we’ll thank you all over again, and so will your grandchildren. Children, obey your parents in the Lord, for this is right. “Honor your father and mother” (this is the first commandment with a promise), “that it may go well with you and that you may live long in the land.” Fathers, do not provoke your children to anger, but bring them up in the discipline and instruction of the Lord (vv. 1–4). John Stott writes in his commentary on Ephesians that Paul emphasizes the restraint of and not the exercise of parental authority. He writes, “Children are to obey, . . . yet they have a life and personality of their own.” I wonder if these young women and Stott aren’t on the same page. So moms, there you have it, from the younger generation to us older. May we listen to these daughters and take it to heart. Anna Clark Wiggins is a wife and middle school math teacher. She and her husband, Glenn, have one daughter, Clark Jaymes.